True to form, Chris Hedges. Come on, Chris! Open your eyes. Go to http://www.patriotsquestion911.com. It’s been there years! 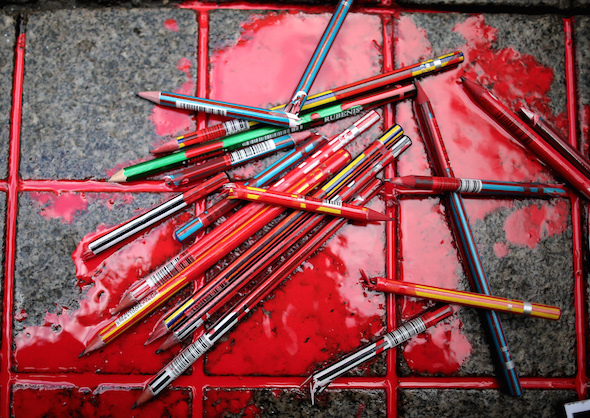 So, the largest pencil in the vigil in Paris, was written in English and not French? “Not Afraid”. Anyone see the overhead photos of the world leaders? They weren’t anywhere near that rally. They were separate from the 1.6 million. STAGED PHOTO OP! Paris shooting was staged. All of us know. Muslims did not attack the newspaper nor the Kosher bakery. “Evidence linking these Israelis to 9/11 is classified. I cannot tell you about evidence that has been gathered. It’s classified information.” — US official quoted in Carl Cameron’s Fox News report on the Israeli spy ring and its connections to 9-11.